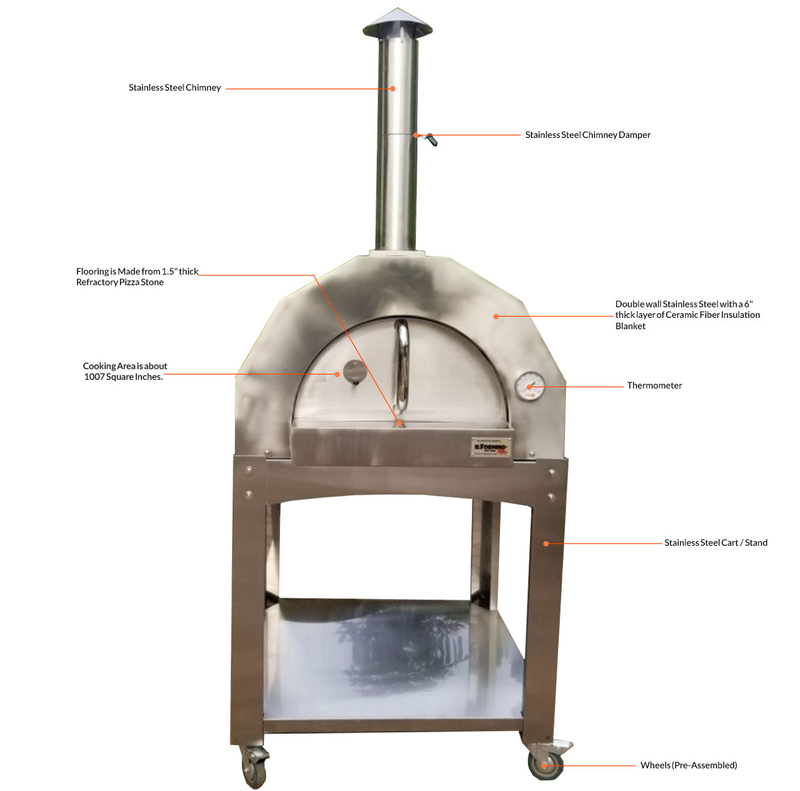 ilFornino® Platinum Series Stainless Steel Wood Fired Pizza Oven- Kitchen Island Ready! Ready to be placed on your mantel or outdoor kitchen island. It includes one professional Brush with Scraper, a professional 10" Pizza Peel, 4 carrying handles, and the user Manual. The oven arrived in about two weeks. Cooking in the oven is a lot of fun. After owning it for less than a week I had a large party and cranked out 36 pizzas in less than two hours. I was cooking the pizzas faster than they were being made. The pizza oven is a huge hit at our house. I ordered the oven, it came so fast and I just as quickly tried it out. Perfect pizza the first go. I love this oven. Very Nice. Cooks pizza very well. Easy to get set up. I simply love this oven by Ilfornino. You won't find another oven with in this price. Amazing cost/benefit ratio and flawless performance. I'm very happy. I received my platium series pizza oven and fired it up for he memorial weekend. Performed very well. I had a learning curve with the fire management. A few times using it will get me where I need to be. Very well built and solid. Be advise it took four adults to get this into my backyard. However very smart design that has pegs that screw into the side for easier handling. I defiantly endorse this product and was very happy to talk with the owner who was good on advice.